Summer is the season for school field trips. There seemed to be more than one hundred students on this field trip. Attending a guest lecture by permaculture designer Cecilia Macaulay gave me a great chance to see one campus of the famous Tamabi art school. This was taken in November so perhaps the lawn and trees no longer so lush. Snowy cherry tree outside elementary school. Heavy snow makes Tokyo oddly quiet. Less than one week later, it feels like a spring afternoon. 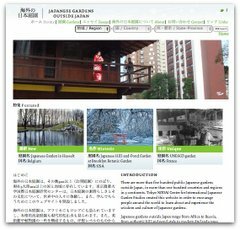 Tokyo becomes oddly quiet during heavy snowfall. Fewer cars, fewer people outside. This cherry tree outside my local elementary school will be blooming in just one more month. I am a big fan of espaliered trees. By pruning a tree into a 2D shape, it fits into the dense urban landscape. Here’s a mature, espaliered persimmon tree in front of a public school in Aoyama. I wonder if the kids will eat the fruit. I am going to be posting this week different fall fruit trees I’ve seen over the past few weeks. What is your favorite urban fruit tree? My Amsterdam-based friends Hiyoko and Mark are in Japan this month developing their Tanemaki (planting) project (twitter @tanemaki2011). Hiyoko is a superb illustrator, and she’s organizing events to support decorating a temporary school in Tohoku. Last week they led a fun two-day tulip workshop at 3331 Arts Chiyoda, and this Saturday will be a pancake-making event with Mammoth School. It’s great to see them developing connections between Japan and the Netherlands, which have a special and long relation. Even in my small balcony garden, I have an area under a plant shelf where I store plants that are dormant or less interesting. Shu recently discovered tall flower stalks on the Cherry Nymph amaryllis from two winters ago. Our amaryllis produced two enormous flowers during rainy season. I noticed in the neighborhood that others also had this amaryllis blooming now, including several pots right alongside Nakano Dori. Below my plant is a recycled nursery school chair from Shizuoka. It’s of course very small, which fits our balcony, but it’s also surprisingly strong. Even though I will be surprised if these pansies can live more than one week in the fluorescent flooded station, it’s lovely to see the flowers with their label identifying the local elementary school. How cool that the students are offering the station something alive. The big cherry blossom sites, including Inokashira park, Yoyogi park and Yasukuni shrine, are wonderful places for get-togethers with outdoor drinking and eating. But I also love seeing the cherry trees in full bloom while walking around the city. This old cherry tree is blooming on a small street, with the Nakano high rise telecom tower in the background. I also love how every public school has at least one cherry tree at the entrance; the elementary school nearby has a dusty soccer field surrounded on three side by gorgeous cherries. A reminder that tomorrow night is the Tokyo DIY Gardening Workshop at 3331 Arts Chiyoda, a great new arts space in a converted junior high school. I took these photos last week when I went there for a planning meeting with my workshop co-organizer Chris Berthelsen of Fixes. 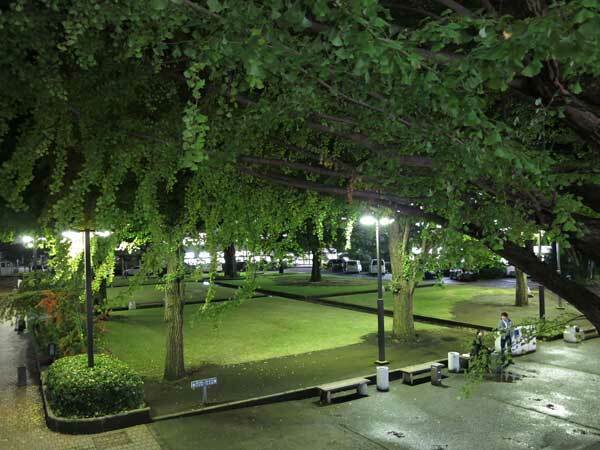 It’s great that in addition to all the art exhibit, gallery and office spaces inside, the front of the 3331 Arts Chiyoda is a very welcoming park with a lawn and shade trees (plus a very popular smoking area next to a public bathroom). 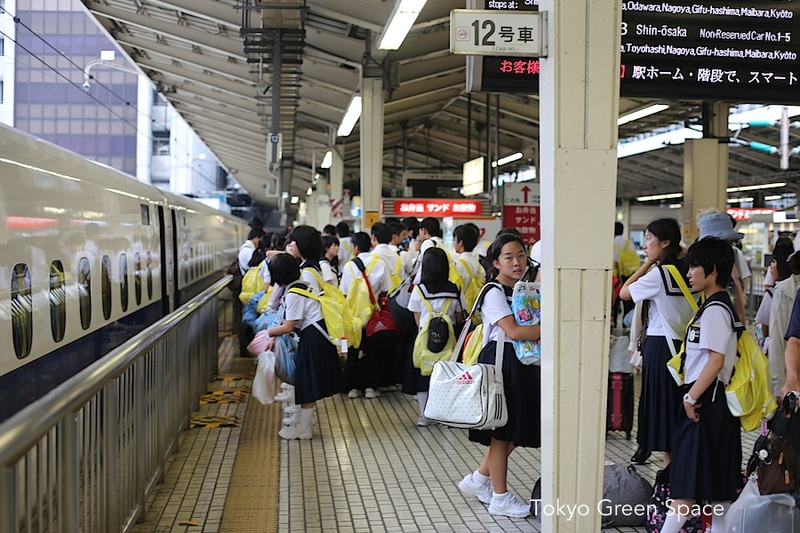 For non-Japanese and non-parents, it’s a great experience to see the inside and even the roof of what seems like a typical city school: old wood shoe lockers, simple yet sturdy furniture, and rooms that seem very Bauhaus in their streamlined functionality. The roof is also interesting because for city schools that is probably where most if not all recreation takes place. For some reason the art space created this small lawn area, and of course I followed Chris’ lead in taking off my sandals and walking bare-foot on the grass. 3331 Arts Chiyoda has also set up dozens of rental plots for people who want to grow vegetables. If anyone is nearby, there seem to be plenty of vacant spaces, and it would be a cool place to grow vegetables and to get to know the arts groups and activities in the building. The chain link fence on the sides and top, the institutional clock, even the caged loudspeakers evoke an ordinary childhood scene that is unfamiliar to me. 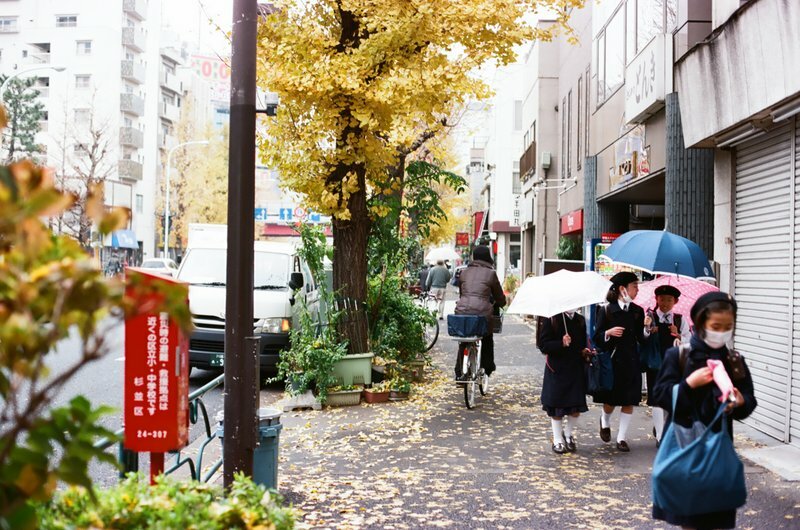 It’s cool to experience these spaces, and imagine that many of the people I know in Tokyo attended schools like this.